Italy is for years now one of the countries of main arrival of migrants in the European Union with record numbers in 2016. However, so far the EU and its Member States still strive to provide a coherent reaction to these people fleeing to Europe to build up a new life. Reacting to the urgent need of innovative and constructive integration strategies, ESOP aims at presenting the European territory in its productive framework giving possibility to young migrants to find tangible solutions to locate and relocate themselves within Europe. The program is not only implemented on a national level enhancing exchange with the local population, but follows a European approach based on the principles of solidarity and freedom of mobility. EU interns representing the host society alongside migrants participating in the program, shall be prepared for an enriching living together in diverse societies. Mutual learning from one another and continuous exchange in dialogue characterize all ESOP activities. Promoting orientation and information for migrants provides them with a foundation for a self-determined life and enhances their active citizenship in their different host societies. An internship in Italy or Germany at the end of the program will be a first concrete step to facilitate professional participation in the European labour market. Through intercultural formation and socio-educational training of the European interns, an awareness towards the need for preparation in the process of integration shall be triggered. 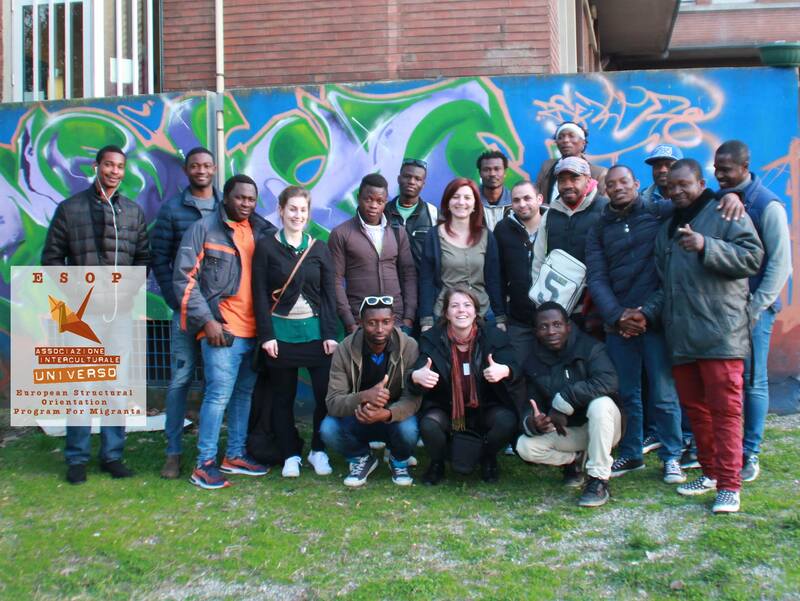 Intercultural exchange activities organised during the program by the ESOP team in Bologna bringing together migrants and autochthons, make possible encounters based on mutual respect and interest in getting to know each other. The program is first tested between Germany and Italy. This binational approach is chosen as a reaction to the fact that many migrants desire to relocate into Europe especially Germany, once they arrive the shores of Italy. As an alternative to a second asylum procedure or to a life in irregularity we use the so far little exploited but very promising channel of legal migration to Germany for educational purposes; a legal stay upon entry into Germany followed by active citizenship. The former interns and participants assuming the role of ambassadors of the program, will lead to the establishment of a transnational support network and further dissemination of the program to local contexts and why not a European framework. Would you like to contribute to the implementation of a new and innovative project? Follow the link; To teach German as a foreign language and For the general implementation of the project. We offer internship opportunities both for the project’s general implementation and for teaching German as a foreign language. Internships for the general implementation of ESOP are possible from June 2017 on. Applications with a later internship starting date are also possible. Our intention is to create a larger network for participation within the EU, therefore we look forward to interesting partnerships and collaborations with public and private organisations, educational institutions and private persons interested in the program. Please, join us!